Thomas J. Boyd, Storekeeper 1/c, born Oct. 6, 1924, Jersey City, NJ, majored in accounting at St. Peter's College. 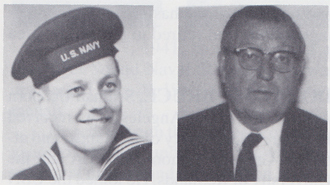 He joined the USN June 23,1943, and was stationed at Newport, RI, Training Center; USS West Virginia, January 1944-April 1946; and the USS Yosemite, October 1950-February 1952. He was discharged April 23, 1946; recalled Oct. 10, 1950; and discharged again Feb. 7, 1952. Awards include the American Campaign Medal, Asiatic-Pacific Medal w/ 4 Bronze Stars, WWII Victory Medal, Navy Occupation Service Medal, National Defense Service Medal, Philippine Liberation Medal w/2 Bronze Stars and the Philippine Presidential Unit Citation. Memorable experiences include seeing Old Glory flying atop Mt. Suribachi and visiting Tokyo after the surrender ceremony; and the comradship of fellow shipmates as evidenced by Wee Vee reunions. Boyd worked as an accountant with Abex Corp. and Jersey City Police Dept. until retirement April 1,1995. He is a fan of all major sports.